SNr receives dopamine from dendrites (dendritic release) extending from dopaminergic neurons of the adjacent nucleus pars compacta (SNc), which is known for its selective degeneration in Parkinson’s disease. Whereas, the significance of dopamine released from nigrostriatal axons has been extensively studied, much less attention has been paid to dopamine dendritically released in the SNr, in particular to the cellular entity expressing dopamine receptors. As a recipient for the released dopamine, the dopamine D1 receptor (D1R) is a primary candidate due to its very dense immunoreactivity in the SNr (Collaboration with Prof. Yoshio Yamamoto, Iwate Univ.). However, the precise location of D1R remains unclear at the cellular level in the SNr except for that reported on axons/axon terminals. Over 30 years ago, Reubi and Sandri reported in electronmicroscopic/freeze etching studies that nigral dendrites fail to form dendro-dendritic contacts in the SNr, but are consistently separated by one or two thin glial sheaths.3) Interestingly, Bosson and colleagues reported that acute interruption of dopaminergic transmission increased astrocyte synchrony in the SNr.4) These studies suggest that astrocytes might well participate in dopamine transmission. Double immunolabeling of SNr cells acutely dissociated from adult wild-type mice brain further revealed marked D1R immunoreactivity in the processes of glial fibrillary acidic protein (GFAP)-positive astrocytes. Such D1R imunoreactivity was significantly stronger in the SNr astrocytes than that in those of the visual cortex. Interestingly, GFAP-positive astrocytes dissociated from the striatum demonstrated D1R immunoreactivity, either remarkable or minimal, similarly to that shown in neurons in this nucleus. 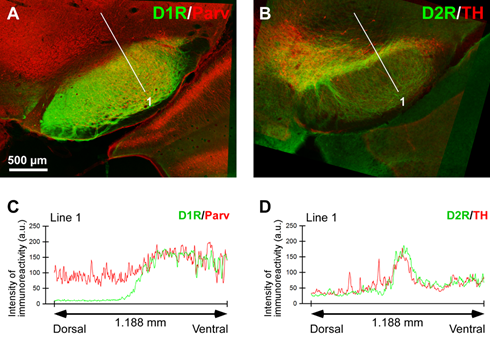 In contrast, in the SNr and visual cortex, only weak D1R immunoreactivity was detected in the neurons tested. These results suggest that the SNr astrocyte may be a candidate recipient for dendritically released dopamine.5) In addition, we speculate that astrocytes may have divergent dopamine receptor expression profiles in a brain area-specific manner. Astrocytes play important roles in the regulation of neuronal transmission. Previously, we found with Dr. Hongjie Yuan (PhD student at that time, Assistant Prof. in Emory Univ. currently) that spontaneous firing rate of SNr GABAergic neurons increased in response to moderately lowering of extracellular glucose concentration6). These neurons also exhibited multi-minutes oscillation7). When conducting the latter study, we obtained data showing that glycine may participate in the regulation of neuron activity in the SNr. However, there was no study reporting glycinergic axon terminal in the SNr. Collaborating with Dr. Koji Shibasaki (Associate Prof. in Gunma Univ.) and Prof. Makoto Tominaga (Okazaki Institute), we addressed this issue by conducting amino acid analyses and a patch clamp biosensor method, reporting that neurotransmitter dopamine causes glycine release from cultured cortical astrocytes by functional reversal of glycine transporter 1, an astrocytic type of glycine transporter8). Although matured astrocytes may differ from the cultured astrocytes, it is interesting to speculate that dendritically released neurotransmitter dopamine can regulate neuronal activity via gliotransmitter glycine release from astrocytes in the SNr. The divergent expression of D1 receptor on astrocytes in SNr, striatum, and cortex implies astrocyte heterogeneity. Further studies are required to elucidate the functional role of dopamine receptors in astrocytes. In addition, it may be interesting to speculate relationships between glycine release from astrocytes and extrasynaptic regulation of NMDA receptors. 1)	Yamada, K. et al., Science 292: 1543-1546 (2001). 2)	Yamada, K. and Inagaki N., J. Mol. Cell. Cardiol. 38: 945-949 (2005). 3)	Reubi, J.C. and Sandri, C. Neurosci Lett 13: 183-188 (1977). 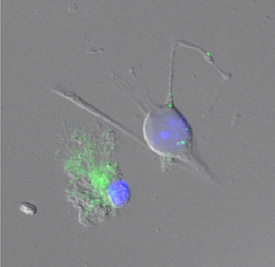 4)	Bosson, A. et al., Glia 63: 673-683 (2015). 5)	Nagatomo, K. et al, Front. Neuroanat. 11: (2017) Doi: 10.3389/fnana.2017.00003. 6)	Yuan, H. et al., Neurosci. Lett. 355: 173-176 (2004). 7)	Yuan, H. et al., Neurosci. Lett. 355: 136-140 (2004). 8)	Shibasaki, K. et al., J. Neurochem. 140: 395-403 (2017).